**Our Ultimate Outsider stamp is located on the outside wall of the office building facing the road. Tall cypress trees that enchant the eye, a Civil War-era mill pond that abounds with wildlife, some of the best kayaking in South Carolina and a one and a half mile, sandy nature trail waiting to be explored can all be found at Goodale State Park. Goodale is sure to please those who love wilderness canoe trips and kayaking in South Carolina, as paddling is one of the park’s main attractions. A little-known paddling trail winds for three miles through cypress trees and aquatic plants and is perfect for wilderness canoe trips taken not so far from the city. A longtime community favorite, Goodale additionally offers shoreline fishing and picnicking. 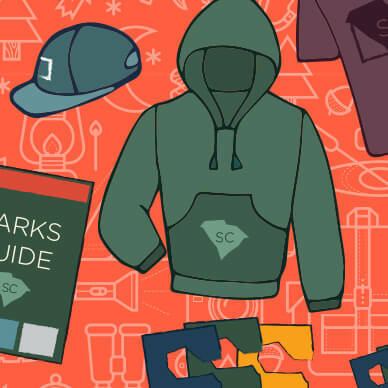 Want more South Carolina parks? Explore a paddler’s paradise at Colleton State Park or enjoy a unique experience at the prime South Carolina golf resort found at Hickory Knob State Resort Park!